Is creativity on the decline? Now, this is a loaded question... and depending on whom you ask you may be given answers at the polar end of the spectrum. Maybe the first question should be: What is ‘creativity’? 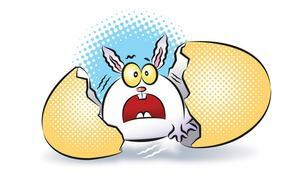 We have all bandied the term around often enough, but do we understand what it means? An innovative, original idea, which says the same old thing in a different way. 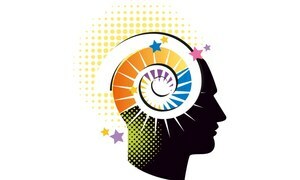 Truly gifted creatives are the people who have unique perspectives and powerful imaginations. So, be nice to the kid sitting in the corner eating all the paste while sticking pictures in a scrapbook with his saliva; he may be your boss one day! Calm down, I’m kidding. That kid needs help. 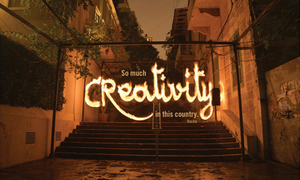 Whenever there is a discussion about creativity, be it film, music, art, literature or advertising, an overwhelming majority seems to be of the opinion that it is on the decline. But then, ever since the beginning of time, the general consensus seems to be that everything is on the decline. You understand that’s impossible, right? You are pining for your youth which makes you nostalgic for the stuff you watched on TV when you were a kid, even if most of that stuff was pretty forgettable. Rose-tinted nostalgia doesn’t make the ads we watched more memorable; it is more the fact that in those days, there were only three channels and we were all watching the same thing. This question of creativity and stagnation rears its ugly head from time to time. We can’t seem to quash it; moreover, we shouldn’t be quashing it (silencing the voice of dissent would make us a police state, and we have been shouting until we go blue in the face that we aren’t one), because creative people thrive on adversity and do some of their best work when they want to prove the naysayers wrong. In fact, one can argue that the advent of a plethora of media channels and digital platforms inherently ensures innovation and creativity that is capable of holding the attention of a flaky audience with the attention span of a goldfish. An audience who is thoroughly spoilt for choice will make you work for every second they deign to spend engaging with your communication. Until about a decade ago, advertising was largely limited to conventional media and even those platforms were not used to their full potential. However, today with the explosion of new platforms, we are forced to think differently when trying to engage with consumers. In this scenario, some companies which don’t have a lot of moolah to throw at the major channels, opt to work smart, spend less and let the public do the work of promoting their ads for them. There is only one catch – the ad has to be brilliant. Most ads tell a story, but the problem is that with diminishing attention spans and rampant FOMO, you don’t have a captive audience and chances are that your ad story will be lost in translation. This has given birth to the atrocity known as ‘the five second video ad’. Everyone hates them; they show up at a crucial point in every video you watch, whether on Facebook or YouTube. For me they have the opposite of the intended effect.They make me vow never to buy the product even if it’s an anti-venom and I was just bitten by a snake; I would rather take my chances on the snake not being poisonous. I can sense you still are not convinced, so I am going to have to bring out the big guns and give you some examples. As this article can’t cover all the examples of ingenuity there have been over the years, I am going to cherry pick some great creative work that has stood out in a sea of mediocrity. I have chosen these ads based on ingenious functionality, filling a gap and social responsibility. 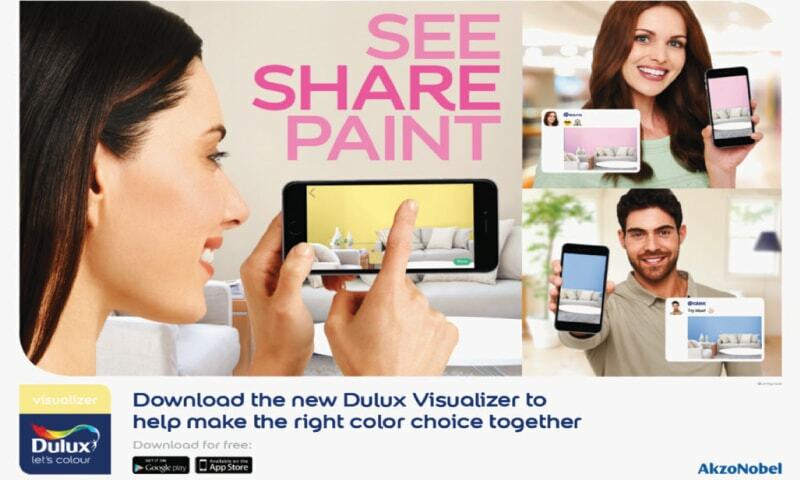 A great example is the ICI Dulux paint app. Painting a room a new colour is a pretty huge not to mention expensive undertaking. You have to be very sure about the colour you decide on. Here comes the ICI Dulux app to the rescue. Not only can you take a picture of the room you want to do over and try different colours, you can use the app to identify colour swatches and share your freshly ‘painted’ room on social media to get the opinion of your friends and family before actually making an investment. Shan had a short lived recipe app which was eventually pulled from the app store, but it was great while it lasted. Simple recipes for even the most culinary challenged among us. You put in the ingredients you have at home and it creates a recipe for you; what could be more convenient? Kinetic launched an on-ground campaign for the launch of Nokia 1 which had a lot of glitz and glamour, with creative backlit floats, an appealing fleet of trikes, hard to miss Nokia 1 Beetle convoys and, last but not least, easily noticeable LED hydraulic floats. These were unleashed in the eight biggest cities in Pakistan, a hard task to accomplish and even harder to miss. Wrollit is an initiative by two wide-eyed kids from the Lahore School of Economics who dream big and believe in cutting out the middleman. Through their initiative, you can have vinyls printed for your car with advertisements on them and make money while you drive around and run errands. Then there is meta creativity, where brands sponsor content and the branded content takes on a life of its own and becomes a behemoth in its own right. Two great examples are Coke Studio and Nescafé Basement. However, closest to my heart are the social causes. 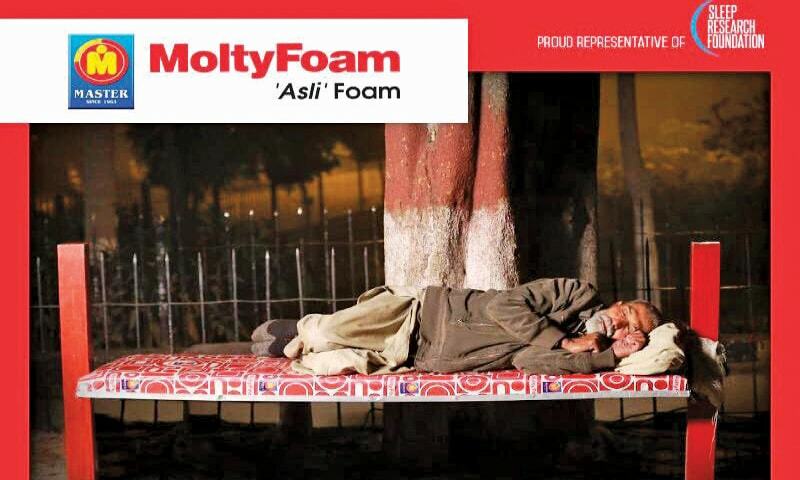 MoltyFoam put mattresses in various areas of the city as part of their campaign ‘The World’s First Billbed’; these ‘ads’ could be used as beds for homeless people. What a wonderful initiative! Not to be outdone, Diamond Supreme Foam followed suit with the #SupremeCleanUpInitiative. 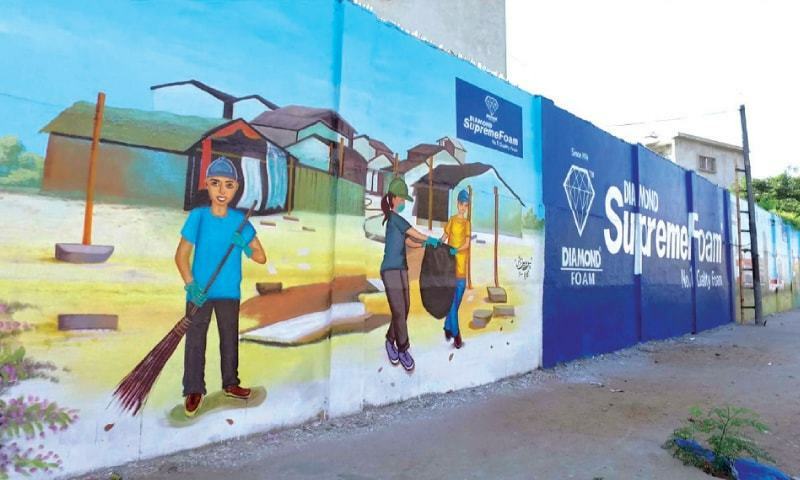 This initiative was spearheaded by Abrar-ul-Haque (their brand ambassador) and included picking up garbage and disposing of it properly, replacing wall chalkings with wall art, repairing roads and street corners, cementing footpaths, planting flowers and placing benches for the convenience of passersby. 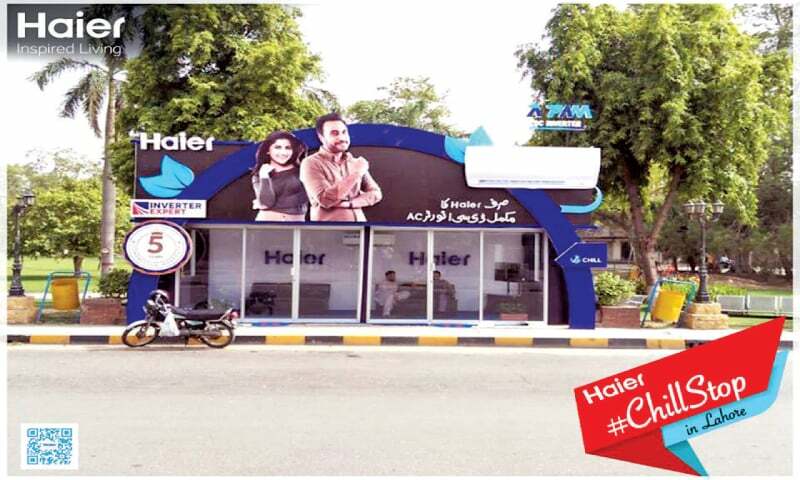 Haier set up air conditioned bus stops and provided cold drinking water inside. As global warming takes its toll and every year summers become more brutal, this was a great initiative for people travelling in the heat to have a little respite before going on their way. Generation did a wonderful inclusive campaign using unknown faces and people that are unconventionally beautiful. The write-up along with the campaign was eloquent and sweet. This is how you do it people! Sana Safinaz could stand to learn a few things from Generation. To conclude, there will always be campaigns that are a ‘swing and a miss’; sometimes so when brands use a tragedy for cheap laughs or a ‘witty’ line that is in very poor taste or when brands take the easy way out by using a celebrity and creating derivative, sub-par advertising. But on the whole, the industry is on the up.